The Rich Man and Lazarus | Is Heaven For Real? really is, and then examine the setting in which Jesus told this story. Perhaps then we will better understand what lessons there are for us in the story of the rich man and Lazarus. The Random House College Dictionary describes a parable as “a short, allegorical story designed to convey a truth or moral lesson.” Cruden’s Complete Concordance further expands this concept, saying that parables in the Bible were used “more generally than elsewhere.” We know that the Bible writers used situations both imaginary—as in the trees asking the bramble to be king over them (Judges 9:8-15)—and realistic in parables. Whatever form the parable took, it was only a vehicle for the moral lesson being taught. It is appropriate here to ask to whom Jesus was speaking in Luke 16:19-31. Which category of people was He dealing with? The last verse before Jesus’ voice begins in this passage tells us. Verse 14 says, “And the Pharisees also, who were covetous, heard all these things: and they derided him.” Jesus was speaking to the Pharisees, a class of men who were notorious all through the Gospels for their refusal to deal honestly with Him and the truths He taught. itself, and try to ascertain the real message Jesus was seeking to convey through it. “There was a certain rich man, which was clothed in purple and fine linen, and fared sumptuously every day: And there was a certain beggar named Lazarus, which was laid at his gate, full of sores, And desiring to be fed with the crumbs which fell from the rich man’s table: moreover the dogs came and licked his sores.” Luke 16:19-21.
for all mankind. They had received “the adoption, and the glory, and the covenants, and the giving of the law, and the service of God, and the promises.” Romans 9:4. Only a Jew would pray to “Father Abraham,” as we find the rich man doing later in the story. The Jewish nation was clearly represented by this character. By contrast, Lazarus symbolized all those people in spiritual poverty—the Gentiles—with whom the Israelites were to share their heritage. The words of Isaiah were well known to the Jews. “I will also give thee for a light to the Gentiles, that thou mayest be my salvation unto the end of the earth.” Isaiah 49:6. Unfortunately, the Jews had not shared their spiritual wealth with the Gentiles at all. Instead, they considered them as “dogs” that would have to be satisfied with the spiritual crumbs falling from their masters’ tables. The metaphor was known. Jesus had used it before in testing the faith of the Canaanite woman. “It is not meet to take the children’s bread, and to cast it to dogs.” She responded accordingly: “Truth, Lord: yet the dogs eat of the crumbs which fall from their masters’ tables.” Matthew 15:26, 27. The rich Jews had hoarded the truth, and in so doing, they had corrupted themselves. Only moments before relating this parable, Jesus had rebuked the Pharisees for their spiritual conceit. “Ye are they which justify yourselves before men; but God knoweth your hearts: for that which is highly esteemed among men is abomination in the sight of God.” Luke 16:15. What was to be the result of this terrible conceit? afar off, and Lazarus in his bosom. And he cried and said, Father Abraham, have mercy on me, and send Lazarus, that he may dip the tip of his finger in water, and cool my tongue; for I am tormented in this flame. But Abraham said, Son, remember that thou in thy lifetime receivedst thy good things, and likewise Lazarus evil things: but now he is comforted, and thou art tormented. And beside all this, between us and you there is a great gulf fixed: so that they which would pass from hence to you cannot; neither can they pass to us, that would come from thence.” Luke 16:22-26. The Jews had enjoyed “the good life” while on earth but had done nothing to bless or enrich their neighbors. No further reward was due. “Woe unto you that are rich! for ye have received your consolation. Woe unto you that are full! for ye shall hunger.” Luke 6:24, 25. Conversely, the poor in spirit, symbolized by Lazarus, would inherit the kingdom of heaven. The Gentiles who hungered and thirsted after righteousness would be filled. The “dogs” and sinners, so despised by the self-righteous Pharisees, would enter heaven before they would. “Verily I say unto you, That the publicans and the harlots go into the kingdom of God before you.” Matthew 21:31. The parable concludes with the rich man begging for his brethren to be warned against sharing his fate. Asking Abraham to send Lazarus on this mission, he alleges “if one went unto them from the dead, they will repent.” Luke 16:30. Abraham replies, “If they hear not Moses and the prophets, neither will they be persuaded, though one rose from the dead.” Verse 31. Jesus thus rebuked the Pharisees for their disregard of the Scriptures, foreseeing that even a supernatural event would not change the hearts of those who persistently rejected the teachings of “Moses and the prophets.” The miracle of raising the real-life Lazarus from the dead soon afterward confirmed the accuracy of Jesus’ conclusion. One did rise from the dead, yet the brothers of the “rich man” did not repent. In fact, the Pharisees even plotted to kill Lazarus after his resurrection. His very life was a reminder to them of their own hypocrisy. 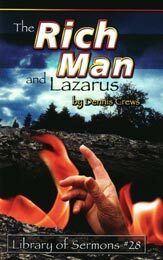 Today many Christians believe that the story of the rich man and Lazarus is a historical account of two individuals’ literal experiences in the afterlife. Based on this belief, some people teach that those who are consigned to the fiery torments of hell will never stop burning throughout all eternity. As with the parable of the trees and the bramble (Judges 9:8-15), however, serious problems arise with a literal interpretation of the story elements. Can we believe that all the saints are even now gathered in Abraham’s bosom? If they are, in whose bosom does Abraham rest? And if there is really a great gulf fixed between heaven and hell, how could the rich man possibly have been heard by Abraham? Perhaps more disturbing, how could the saints enjoy the comforts of heaven while enduring the cries of the wicked being tormented? Another dilemma that arises with a literal interpretation of this story could be called “the mystery of the empty graves.” If this is taken literally, apparently neither of the two leading characters spent very long in the grave—both being whisked away rather quickly to their respective places of reward. Their bodies obviously came along, for we find the rich man lifting up his eyes, and desiring to have his tongue cooled by a drop of water from the finger of Lazarus who was resting, as we have seen, in Abraham’s bosom. Enough graves have been exhumed in recent years to know that the bodies of the deceased are carried neither to heaven or hell after burial. They finally turn to dust and await the resurrection. From these few examples, we begin to see that in this parable, Jesus was not trying to explain the physical realities of the afterlife. Instead, He was referring to the unfaithfulness of the Jews regarding their assigned responsibility. As stewards of the special message of truth, they utterly failed to share it with the Gentiles, who were eager to hear it. In fact, the entire chapter of Luke 16 is devoted to the subject of stewardship. Beginning in verse one, Christ gave another parable about stewardship of money or property. “There was a certain rich man, which had a steward; and the same was accused unto him that he had wasted his goods.” After dealing with the principle of being entrusted with material goods, Jesus opened up the issue of being entrusted with the truth. By the parable of another rich man, He graphically illustrated how they had proven just as unfaithful with spiritual riches as the steward had been unfaithful with physical wealth. is to miss the point Jesus intended to convey. The Bible speaks with unmistakable clarity on the subject of hell in many other places. Nowhere do the Scriptures teach that the wicked will continue to suffer in the fires of hell through the ceaseless ages of eternity. Rather, they will be utterly destroyed. Jesus never would have compromised the integrity of the Holy Scriptures by teaching a doctrine contrary to its own overwhelming testimony on the subject. life.” Romans 6:23. There are only two alternatives for every soul. Those who accept Jesus Christ and His atoning sacrifice will live forever; those who do not accept Jesus will die. If the wicked suffered without end, eternal life—however painful—would be theirs. But we know that eternal life is available only to those who accept Jesus. Consider these clear texts of Scripture that speak of the reward of the wicked: “But the wicked shall perish, and the enemies of the Lord shall be as the fat of lambs: they shall consume; into smoke shall they consume away.” Psalm 37:20. “For, behold, the day cometh, that shall burn as an oven; and all the proud, yea, and all that do wickedly, shall be stubble: and the day that cometh shall burn them up, saith the Lord of hosts, that it shall leave them neither root nor branch.” Malachi 4:1. “And ye shall tread down the wicked; for they shall be ashes under the soles of your feet in the day that I shall do this, saith the Lord of hosts.” Malachi 4:3. “And fear not them which kill the body, but are not able to kill the soul: but rather fear him which is able to destroy both soul and body in hell.” Matthew 10:28. “But the day of the Lord will come as a thief in the night; in the which the heavens shall pass away with a great noise, and the elements shall melt with fervent heat, the earth also and the works that are therein shall be burned up.” 2 Peter 3:10. “But the fearful, and unbelieving, and the abominable, and murderers, and whoremongers, and sorcerers, and idolaters, and all liars, shall have their part in the lake which burneth with fire and brimstone: which is the second death.” Revelation 21:8.
of the wicked. In no way should these clear words be misunderstood by one who honestly desires to know truth. There is a fire reserved for the wicked, but a fire so hot it will utterly destroy all who are engulfed by it. When the fire has done its work, it will go out. is not taught anywhere in the Bible—not even in the story of the rich man and Lazarus. (Some people have wondered what the expression “for ever” means in the usage of Revelation 20:10. Other similar passages demonstrate this merely to mean as long as a person lives. See Exodus 21:6; 1 Samuel 1:22; Jonah 2:6, etc. Also, the expression “eternal fire” may be understood in terms of consequences rather than duration, as in the example of Sodom and Gomorrha in Jude 7). It would be tragic to miss the actual point of the parable by removing it from the setting in which Jesus gave it. Let’s accept the lesson He was trying to teach and apply it to our own lives. Are we doing all we can to spread the message of salvation to others? Do we have a genuine love for those around us, and have we invited them to share our spiritual inheritance? If we hoard our riches, like the Jews of old, we will become self-righteous and corrupt. In contrast, by active, loving service, our relationship with Christ as well as with others will become stronger and more meaningful. Let us not make scary stories the basis of our Christian experience. Instead, let us understand that “God so loved the world, that he gave his only begotten Son, that whosoever believeth in him should not perish, but have everlasting life.” John 3:16.
and banned from the land (verse 3; Leviticus 20:27). God had left Saul and would not communicate with him (verse 15). soul. 4. Samuel is described as “an old man covered with a mantle.” Is this the way immortal souls appear? And where did the soul get the body? They’re supposed to be disembodied. Was there a resurrection? Did God obey the beck and call of the witch, and raise up Samuel? If not, can Satan raise the dead? The apparition of Samuel told Saul, “Tomorrow shalt thou and thy sons be with me.” Saul committed suicide on the battlefield the next day. Where did Samuel dwell, if the wicked Saul was to go to the same place? The record never says that Saul saw Samuel. He received his information as second hand from the witch, and only concluded it was Samuel from her description. The truth is that the devil deceived the dissolute old woman, and she deceived Saul. It was nothing more than a devil-generated séance. The enormity of Saul’s sin is revealed in these words, “So Saul died for asking counsel of one that had a familiar spirit, to inquire of it; And inquired not of the Lord: therefore he slew him.” 1 Chronicles 10:13, 14. Jesus clearly teaches in this text that the soul is not naturally immortal. It can and will be destroyed in hell. But what does He mean about killing the body, but not the soul? Is it possible for the soul to exist apart from the body? Some say it is, but the Bible indicates otherwise. But what of Matthew 10:28? Put in the word “life” instead of “soul” and the text makes perfect sense in its consistency with the rest of the Bible. The contrast is between one who can take the physical life, and He who can take away eternal life. Here is proof in the words of Jesus: “And I say unto you my friends, Be not afraid of them that kill the body, and after that have no more that they can do. But I will forewarn you whom ye shall fear: Fear him, which after he hath killed hath power to cast into hell.” Luke 12:4, 5. In other words, the word “soul” here means not only life, but also eternal life. Notice that Luke says everything just like Matthew except that he does not say “kills the soul.” Instead, he says, “cast into hell.” They mean the same thing. Men can only kill the body and take away the physical life. God will cast into hell and take away eternal life. Not only will their bodies be destroyed in that fire, but also their lives will be snuffed out for all eternity. Paul says, “the wages of sin is death.” Romans 6:23. John describes that death as “the second death” in Revelation 21:8. That death or destruction will be eternal. In this verse, the word “hell” is translated from the Greek word “Gehenna,” which is another name for the Valley of Hinnom just outside the walls of Jerusalem.There the refuse and bodies of animals were cast into an ever-smoldering fire to be consumed. Maggots that fed on the dead bodies were constantly destroying what might escape the flames. symbolized a place of total destruction. will go out after it has finished its work. Jerusalem burned with unquenchable fire (Jeremiah 17:27) yet it was totally destroyed (2 Chronicles 36:19-21). The flames and worms of Gehenna represented the total annihilation and obliteration of sin and sinners. With the fires of Gehenna burning before their eyes, Jesus could not have spoken a more graphic word to the Pharisees to describe the final total destruction of sinners. are thrown into a real dilemma. Why? Because the fire and worms are working, not upon disembodied souls, but bodies! In Matthew 5:30 Christ said, the “whole body” would be cast into hell. In Isaiah 66:24, the same Gehenna picture of hell is presented with the unquenchable flame and the destroying worms. But in this case, the word “carcasses” is used, revealing the fact that the fire consumes dead bodies, not disembodied souls. of God,” and Revelation 22:1, 2 describes the tree of life by the side of the river of life which flows, in turn, from the throne of God. So there is no question about Paradise being where the Father’s throne is located. The question is: How could Jesus tell the thief that he would be with Him in Paradise that day, when He did not go there until three days later? In the second place, Jesus and the thief did not even die on the same day. When the soldiers came just before sunset to take the bodies off the cross, Jesus was already dead (John 19:32-34). The thieves were very much alive, and their legs were broken to hasten death and to prevent them from escaping. They undoubtedly lived on past sunset into the hours of the Sabbath and possibly longer. So how could Jesus assure the thief of being with Him in Paradise that day when they did not both die on “that day”? He also speaks of being clothed with “our house which is from heaven,” (verse 2) and again, he longs “that mortality might be swallowed up of life.” Verse 4. But the key to the entire discourse lies in the description of a third condition. After desiring to be clothed upon with immortality, Paul states that “being clothed we shall not be found naked.” Verse 3. Putting it yet another way, he said, “not for that we would be unclothed.” Verse 4. Clearly, the naked or unclothed state was neither mortality nor immortality, but death and the grave. Paul realized that one did not pass instantly from being clothed with this tabernacle into being clothed with our house from heaven. Death and the grave came in between, and he referred to it as being unclothed and naked. In another text, Paul spelled out exactly when that change from mortality would take place. In 1 Corinthians 15:52, 53 he wrote, “The trumpet shall sound and this mortal must put on immortality.” That will be when Jesus comes. There has been considerable misunderstanding of these verses of Scripture. It has been preached that Christ actually descended into the lower regions of the earth and preached to lost souls that were imprisoned in some purgatory or limbo. This is very far from what the text actually says. Let’s look at it closely now and get the real message of these verses. It says that Christ suffered once for sin that He might bring us to God by being put to death in the flesh. But He was quickened by the Spirit by which also He went and preached. First of all, notice how Christ preached to those spirits in prison. He did it by the Spirit, and that word is capitalized in your Bible. It actually refers to the Holy Spirit. So whatever Christ did in preaching during this period of time, He did it through or by the Holy Spirit. With that in view, let’s ask this: When was the preaching done? The answer is plainly given in verse 20, “When once the longsuffering of God waited in the days of Noah, while the ark was a preparing.” So, the preaching was actually done while the ark was being built—during the preaching of Noah to that antediluvian world. Now, one more question: To whom was the preaching done? The text says here “to the spirits in prison.” Throughout the Bible, we find this terminology used in describing those who are bound in the prison house of sin. David prayed, “Bring my soul out of prison.” Psalm 142:7. Paul spoke of his experience in these words: “bringing me into captivity to the law of sin.” Romans 7:23. What Peter is telling us here is simply that Christ through the Holy Spirit was present while Noah preached; Christ was there through the Holy Spirit to speak conviction to their hearts and appeal to them to come into the ark. There is absolutely nothing here that indicates that Jesus departed from the body during the time He was dead to go to any subterranean place to minister to wicked spirits. The three questions are clearly answered in the text itself, that He preached by the Holy Spirit, He did it while the ark was being prepared, and He did it to the spirits in prison or to those individuals whose sinful lives were bound in the prison house of sin. ascendeth up for ever and ever: and they have no rest day nor night, who worship the beast and his image, and whosoever receiveth the mark of his name.” The words “for ever” do not necessarily mean “without end.” In fact, the Bible uses the term 56 times (“for ever” can be found in your biblical concordance under “ever”) in connection with the things that have already ended. In Exodus 21:1-6 the Hebrew servant was to serve his master “for ever,” but it was obviously only as long as he lived. Hannah took her son Samuel to God’s house to abide “for ever,” but she plainly limited that time to “as long as he liveth.” 1 Samuel 1:22, 28. The term is very clearly defined in Psalm 48:14, “For this God is our God for ever and ever: he will be our guide even unto death.” The desolation of Edom was to continue “for ever and ever.” Isaiah 34:10. Christ is called “a priest for ever” (Hebrews 5:6), yet after sin is blotted out Christ’s work as a priest will end. The Bible states, “The wicked … shall be destroyed for ever.” Psalm 92:7.